One of the admirable qualities about local theatre in South Florida, aside from the usual touring revivals of classic musicals and plays, is that some will take chances on innovative new productions. I’m referring in particular to original productions offered by The Florida Stage in Manalapan and Dramaworks in West Palm Beach over the years. Yesterday we saw such a work -- CAGNEY! -- a world premiere at Florida Stage. I was wondering how the life story of the famed Jimmy Cagney could be carried off as a musical and the answer is the passion and commitment of one man, Robert Creighton, the lead actor, who conceived the work, and wrote the music and lyrics along with Christopher McGovern. Creighton is also a dead ringer for Cagney and Ann and I were taken in by the play and his inspired performance. In fact we felt as if Creighton was channeling Cagney himself. It is the rare creative genius who can bring it all together – the vision, the ability to write music and lyrics, and then to act, sing, and dance as well. 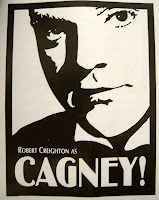 Creighton is one of a handful of unique actors able to create such a work as CAGNEY! He joins Hershey Felder who was brilliant in bringing GEORGE GERSHWIN ALONE to life, which we were fortunate to see at The Cuillo Centre for the Arts in West Palm Beach several years ago. It ultimately made its way to Broadway, and Felder was actor, pianist, playwright and arranger. (Believe me, as an amateur pianist I have a special appreciation for Gershwin and the skill needed to do justice to his music which embodies elements of jazz, ragtime, and classical.) No one could have accomplished that better than Felder, as no one could have created such a successful, moving musical on Cagney other than Creighton. My Uncle Phil had a summer home in Stanfordville, New York where I used to spend time as a kid and Cagney bought a farm there in the mid 1950’s, one that we frequently drove by, usually trying to catch a glimpse of the great actor, but Cagney kept to himself and was rarely seen in the area. CAGNEY! reminded me of those days and roused my interest in learning more about his life. Wikipedia has a good detailed write up and after reading the entry, I am astonished by the musical’s level of detail and accuracy. But most impressive is CAGNEY! as a musical itself. This is not a little revue with some nice song and dance numbers. On a smaller stage it follows the principles of the great musicals of our times. The story line, songs and the chorography are woven together with one element advancing the other. We never felt that we were being “performed to” but, instead, brought into the action and moved every step along the way. The entire cast was outstanding, obviously being inspired by Creighton as well. It also follows the traditions of excellence from the Great American Songbook with witty lyrics sometimes reminiscent of Cole Porter or Ira Gershwin, seamlessly woven into the music, appropriate for the era and the major themes of work. They brought out the tensions between Cagney and Jack Warner, Cagney’s bulldog convictions, his devotion to his mother and his wife, and the accusation of his being a Communist sympathizer, an irony not lost by Creighton’s depiction of Cagney as George M. Cohan in Yankee Doodle Dandy. I hope that, as with Felder’s work, CAGNEY! will find its way to a larger audience perhaps on Broadway. But my concern, after my generation dies away, is that there will be succeeding generations who care enough to preserve the memory of people such as James Cagney and, equally important, dedicated to carrying on the traditions of the Great American Songbook. Creighton’s musical, not to mention his performance, accomplishes just that and I can think of no greater compliment.